Arctostaphylos patula growing on site near Whychus Creek south of Sisters, OR. Here it is 5′ tall growing in a mixed condifer forest along with Doug Fir, Grand Fir, Noble Fir, Ponderosa Pine and Western Juniper. Outside our breakfast window, when I was a kid, was an Arctostaphylos patula. I never thought that much of it at the time, and how unusual it was, that sometime, probably by the late ‘40’s or early ‘50’s, somebody had dug one up and transplanted it to our yard in Redmond. They are denizens of the eastside Ponderosa Pine forest ecotone not the Sagebrush ecotone where I grew up. We averaged less then 10” of precipitation a year, too dry (For those who don’t know Redmond, OR, lies wholly within Oregon’s High Desert country that puts it in USDA zone 6b, -5 to 0 F). It grew in this little jog of the house facing northwest. I’m sure it got overspray from when we dragged hoses and sprinklers around to keep the lawn green, which is probably why it had grown with some vigor, having a form that you wouldn’t see in the Ponderosa – Juniper transition band sixteen to twenty miles away. In my memory it was always clean, with bright green foliage, part of which can be attributed to the low desert humidity and our sandy soil. I wish it was still there to take a picture, but the house has sold several times and had ‘improvements’ to the structure and the landscape including an irrigation system. I don’t know whether it rotted out or they removed it for one of their remodel projects. In its day it was 6’ high x 7’-8’ across with the characteristic sinewy branches and smooth peeling red bark. 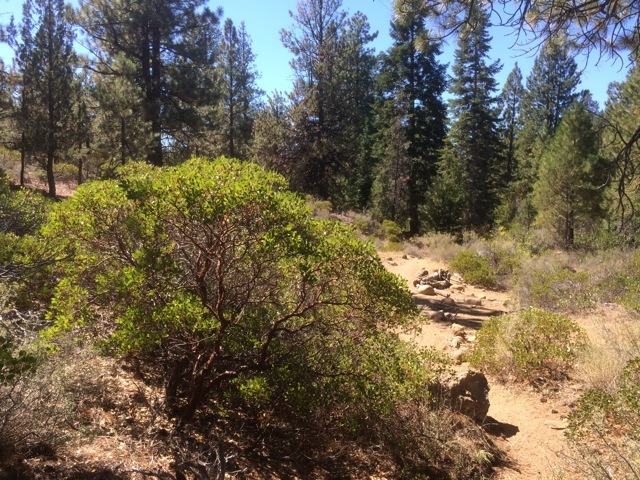 This entry was posted in Central Oregon, Landscapes and tagged Arctostaphylos, Ponderosa Pine/ Juniper Ecotone on September 12, 2014 by gardenriots. Whychus Creek starts up in the Three Creeks area south of Sisters, OR, below Broken Top and the Three Sisters, and runs north-easterly to where it joins the Deschutes River winding much of the way through a canyon carved through basalt. It’s a beautiful band of green cutting its way through the Juniper – Sagebrush Scrub country where I grew up. I’d never been to the Preserve before and was happy to see it mostly intact. Though development has been creeping up along some of its edges the Preserve is being actively managed by the Deschutes Land Trust these days. We hiked it on June 26 and many plants were still in bloom. Many people from the wet side of the Cascades have never developed an appreciation for the starkness of Oregon’s High Desert country. Julie and I both grew up over here and where some people see barreness we see country defined by its sky, its geology and the spaces in between that set off the unique character of everything that lives here. We took this hike with long time friends, Robert and Elayne, who stayed in Bend when we and others left. This entry was posted in Central Oregon, Landscapes and tagged Hike, Ponderosa Pine/ Juniper Ecotone on September 9, 2014 by gardenriots.